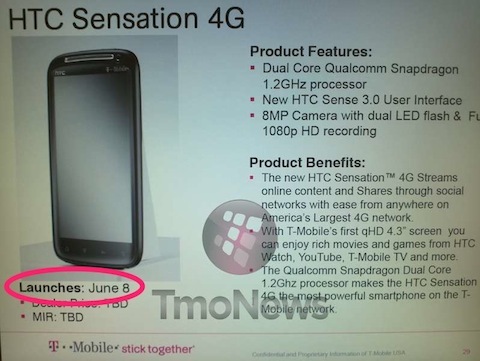 A screen shot leaked earlier today confirming a June 8 launch date for the HTC Sensation 4G on the T-Mobile network. There has been other evidence pointing to a June 8 launch date in the past, so this news just confirms it and makes the evidence stronger. The HTC Sensation 4G runs on Android and features HTC’s new Sense 3.0 UI. It has a qHD 4.3-inch display that beautifully displays movies and games. The phone’s speed is extremely fast, with a 1.2GHz processor from Qualcomm. Hi there very cool blog!! Man .. Beautiful .. Superb .. I will bookmark your web site and take the feeds additionally?I am glad to find numerous helpful information here within the put up, we’d like work out extra techniques in this regard, thanks for sharing. . . . . .